On 4 September, during the 2017 BRICS summit in Xiamen, China Merchants Port Holdings (CMPort) signed the share purchase agreement with TCP Participações S.A. (TCP) to acquire a 90% stake in TCP, the joint-venture that operates the port of Paranaguá, Brazil, informs the Group. The disclosed purchase price is 2.89 bln Brazilian reals (USD 925 mln). The Port of Paranaguá is located around 300 km southbound from Sao Paulo and hosts Brazil’s second largest container terminal – Terminal de Contêineres de Paranaguá. Its design capacity of 1.5 mln TEU per year is planned to be increased to 2.4 mln TEU with the expansion commencing later this year and expected to complete by the second half of 2019. However, the current capacities seem to be underutilized, as in 2016 the terminal is said to have handled around 740,000 TEU. According to market experts, TCP is a very attractive asset for CMPort, making its first investment in Latin America. “It’s very profitable, with an EBITDA margin in excess of 60%, and it has a strong market in gateway traffic, including specialised reefer traffic,” comments Neil Davidson, Senior Analyst of the Ports and Terminals sector at Drewry. TCP is 50% owned by Advent International and 50% by a consortium comprising Galigrain, Grup Maritim TCB (now part of APM Terminals), Pattac, Soifer and TUC Participações Portuárias. Under the terms of the deal, Advent, Galigrain and TCB will sell their shares in TCP, while Pattac, Soifer and TUC will together retain a 10% stake in the company. This means that APM Terminals have to sell its 5% share in TCP, which was acquired in March 2016 as part of the Grup Maritim TCB acquisition. 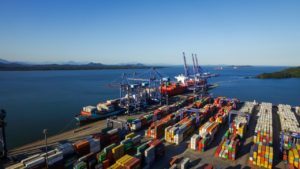 Confirming the sale, APM Terminals comment that despite the divesting of this small share, the terminal operator continues to be strong in Brazil, offering its services in the ports of Itajai, Pecem and Santos. The CMPort acquisition deal is subject to regulatory approval but is expected to be finalized by the end of 2017.